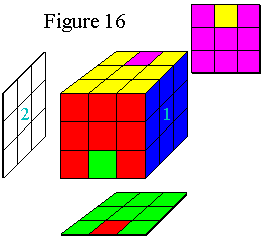 The following "Rube Move", named after Mr. Rubik himself (since he formulated it), will flip the two center-edge pieces on the top side of the cube shown in Figure 15. If two center-edge pieces are correct and the two that are wrong are diagonal to each other then perform step 7b and proceed to step 7a. First orient the cube so that the two misoriented center-edge pieces are on the top side of the cube as shown in Figure 15 and perform Move 8. Next, place the remaining two center-edge pieces in the top positions and, if misoriented, perform Move 8. In words, rotate the middle vertical slice (between the blue and white sides) one quarter turn clockwise (away from you), the top side 1/4 turn clockwise, the vertical slice 1/4 turn up, the top 1/4 turn clockwise, the vertical slice 1/4 turn up, the top two quarter turns (half-way around), the vertical slice 1/4 turn counter-clockwise (back toward you), the top 1/4 turn clockwise, etc. Position the cube as shown in Figure 16. Rotate the front (red side) two turns (F2), perform Move 8, then rotate the front two more turns (F2). You are essentially making the cube look like Figure 15, then using Move 8, then re-orienting the front pieces. Congratulations, you've solved the cube.